How many miles/kilometers has your MX-5 traveled? 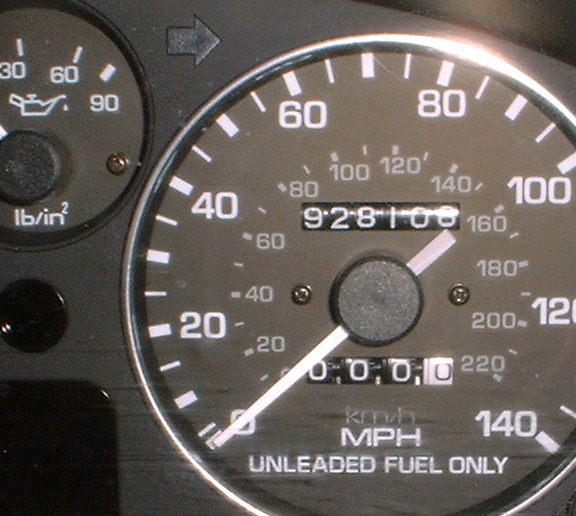 Ralph sent us this photo of his 1990 Miata with 468,920 miles on the odometer! We're not all that surprised - MX-5 Miatas are incredibly reliable. I bought in new in 1990. Since then I have changed the clutch 3 times (I will be proactively changing it again in a few months) All the wheel bearings once, one timing belt change, twice replaced the starter, three alternator changes shortly after changing the stereo, changed all the incandecent lights to LED's and that stopped. No work has been done on the engine and drive train except what I've stated and a "temporary" repair I did to the lower timing belt sprocket keyway and ~230,000 miles. I've since outfitted the machine with a dash-cam and replaced the rear overload bumpers with air bags to assist in towing (for about four years I routinely used the MX-5 to tow a half ton of batteries about three times a week to and from jobs, hint: My clutch lasted less than 100,000 miles during that time) I've done all the work myself and have extensive records showing the parts I've purchased from time to time with the occasional trip to a dealer or shop to have the injectors cleaned, etc. It still surprises me every time I put the key in the ignition and it runs. Anyway, I'm committed now. Have to see it through to half a mil just for the bragging rights before I move on. Why is a Million Mile Miata an Honorable Mention and not the lead story? Frankly, its because we're having such a hard time believing its real. Dan Masterson's red 1992 Miata has been through the hands of 9 different owners, as well as being used by teenagers and for a courier delivery job. It is literally almost never in the driveway. One of the previous owners also made regular trips from coast to coast in the United States. This car has had 12 timing belt changes over two engines. It is also on the third transmission. It is for real, no Photoshop. I think it is absolutely amazing, but most of the service records have gone with the owners, there is not a consistent log. I have done all of the service myself except for the transmission replacement in the nearly 2 years since I bought it with 750,000+ miles. That has also included 3 timing belt replacements and quite a bit of replacing parts. Twelve timing belt replacements total may be a high estimate, but it has probably had it done at least 8 or 9 times. We were still wondering if it wasn't a photo of a speedo that was removed from the car, with someone having used a drill to fast-forward the digits. Not wanting to be victims of a clever ruse, we asked Dan if he could supply some proof in the form of service records. Do you know someone who can top this? If you or someone you know has photographic proof of an MX-5 Miata with more than 450,000 miles, please let us know. Don't forget to provide a photo! Note: If you don't have more than 450,000 miles, please don't contact us - we have our hands pretty full as it is.